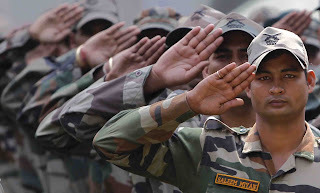 Soldiers, sailors and airmen of the three defence services will hereafter be paid salaries recommended by the 7th Central Pay Commission (7CPC). The new scales will be paid with effect from January 1, 2016. In June 2016, the Cabinet had approved 7CPC scales for civilian employees with effect from January 1, 2016, resulting in additional financial outgo of Rs 84,933 crore. However, the three service chiefs had requested that payment be made to defence personnel only after an Anomalies Committee resolved the military’s representations against the 7CPC recommendations. While the military’s three key requests have not been addressed in this award, Defence Minister Arun Jaitley revealed two significant concessions in a press briefing in New Delhi on Wednesday. First, disability pension for soldiers would henceforth be paid at the same scales as civilians. The generals had protested the 7CPC order that disability pensions be paid to the military at a flat slab rate, rather than as a percentage of salary. This had sharply reduced the disability pensions almost across the board. “The Cabinet also approved the retention of percentage-based regime of disability pension implemented post 6th CPC, which the 7th CPC had recommended to be replaced by a slab-based system”, said a government notification. This would involve an additional outgo of Rs 130 crore per annum. Second, a modified method of calculation will increase the pension of servicemen who retired before 2016, benefiting over 55 lakh pensioners. This involves an additional payout of Rs 5,031 crore for 2016-17, which would increase this year’s pension allocation of Rs 85,740 crore. Even so, there is disappointment within the three services that the award has not addressed three key “anomalies”, which had been strongly endorsed by the three service chiefs. The first of these relates to errors of logic and arithmetical calculations in fixing the pay scales of various ranks in the military. Second, while “military service pay” (MSP) was fixed at Rs 15,500 per month for officers and Rs 5,200 per month for “junior commissioned officers” (JCOs) and other ranks (ORs), the military pointed out that JCOs, who are Group “B” employees, should receive a higher MSP than ORs, who are Group “C” employees. The third military request involved the grant of “non functional upgradation” (NFU), which involves the automatic upgrade of salary scales for all persons, regardless of whether they were selected for promotion to higher grades, in tandem with those who were selected for promotion, with a lag of two years. This benefit is granted to all other central government employees. Jaitley clarified that the first two issues are being addressed by the Anomalies Committee, while the NFU issue is before the Supreme Court. The government has appealed to the apex court after the Armed Forces Tribunal ordered the payment of NFU to military personnel. Pending the implementation of the 7CPC award to military personnel, the government had granted an interim salary hike of 10 per cent to all services personnel across the board. Since the average salary hike proposed by the 7CPC amounts to approximately 15 per cent, the new orders will marginally raise the payout of salaries and pensions, and arrears. Now what are the benefits added to jco/ ors. Now the power ranks get only the following benefits note that. Here after the PBORS are called JCO/ORS. Thats all you got after rectification of the 7cpc. In civil pay scale all scales from president to chaprasi published in one page. But Defence officers are gods their pay scale published in separate pages. These Gods still are still cheated with several pages. The GOI is straight forward with civilians and not with your so called Gods.